Sizzling star: Hot explosions in an active region of the Sun. In this image of the photosphere that was obtained at the end of September 2013 with the help of IRIS, the explosions are the bright spots. The image shows a sector with a size of 50,000 kilometers by 25 000 kilometers. The Sun is more spirited than previously thought. Apart from the solar eruptions, huge bursts of particles and radiation from the outer atmosphere of our star, also the cooler layer right below can be the site of explosions: in some areas magnetic energy builds up and discharges within only a few minutes in temperature eruptions of up to 100000 degrees. Researchers under the lead of the Max Planck Institute for Solar System Research have now for the first time found evidence of such short-lived heat pockets in data from NASA's space telescope IRIS (Interface Region Imaging Spectrograph). The Sun is an incredibly hot place, but even though in all its layers the temperatures are daunting, some are hotter than others. With a temperature of approximately 5000 degrees, the Sun's visible surface, the photosphere, for example, is comparatively cool. Going outward from there, the temperatures within the Sun's atmosphere rise, first moderately and then sharply, until they reach one million degrees. "Our analysis shows, that this temperature distribution is not the same everywhere, and is constantly in motion", says Prof. Dr. Hardi Peter from the MPS, the paper's first author. Together with an international team of scientists, Peter analyzed data from the space telescope IRIS taken from active regions on the Sun. These regions within the photosphere are characterized by high magnetic field strengths and are the "birth places" of the dark sunspots, which cover the Sun's surface, at some times more, at others less abundantly. "In these regions we found heat pockets as big as half of Germany. They are up to 20 times as hot as their surroundings", the astrophysicist describes. The heat pockets flash up for only minutes and then return to their normal state. The amount of energy released during these explosions would be sufficient to provide all of Germany with electrical power for 8000 years. 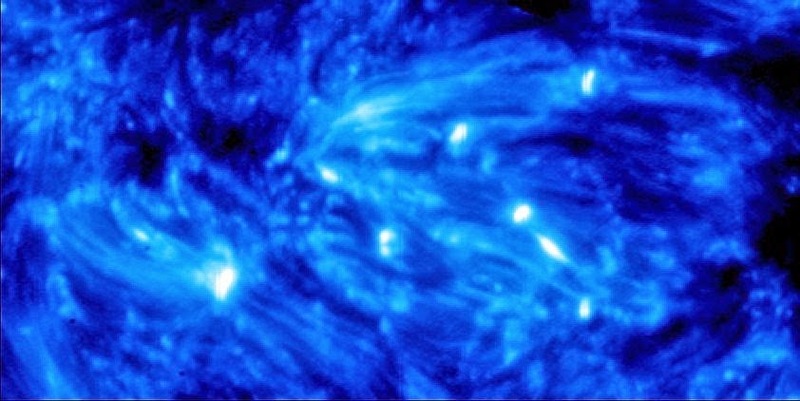 The massive photospheric explosions cannot be spotted in visible light, but leave traces in the ultraviolet radiation the Sun emits into space. IRIS can split this ultraviolet radiation into its constituting wavelengths more precisely than any other solar observatory before. In addition, it offers an unprecedented spatial resolution. When IRIS opened its eyes to the Sun for the first time in July of last year, it could discern structures with a size of only 250 kilometers and examine radiation from such small regions separately. "To our great surprise, we found well-defined areas within the active regions emitting radiation quite unlike the radiation from their vicinity", says Peter. The researchers discovered characteristic wavelengths that special highly ionized atoms within the solar plasma such as triply ionized silicon ions emit into space. "The presence of these wavelengths within the spectra points to very high temperatures", says Peter. Only under such conditions can silicon loose three of its electrons, but in which of the Sun's layers did this temperature arise? Truly within the cool photosphere? Or maybe, and this would be much less spectacular, farther outside in the much hotter atmosphere? 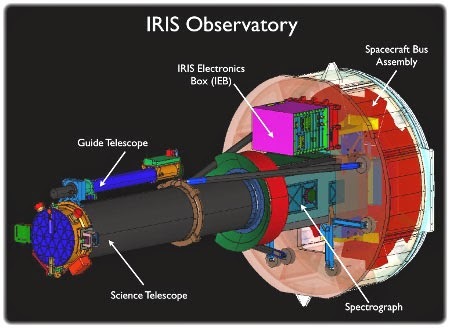 The spectral data from IRIS proved to be so detailed that the researchers could extract further decisive clues. 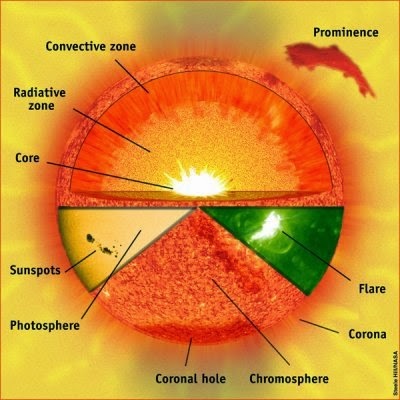 For example, they were able to infer the density of the solar plasma where the radiation originated. In addition, they showed that the radiation had encountered singly-ionized iron ions on its way outward. These ions occur only in cooler regions. "All in all, we found a coherent picture: the unusual radiation must originate in the cool outer photosphere" says Peter. The researchers believe that the strong magnetic fields in the photosphere provide the necessary energy for the explosions. In the area of the sun spots, the magnetic field lines protrude in a loop-like fashion from the Sun's surface; hot plasma flows there. When these flows are short-circuited, the explosions occur. "The new results have fundamentally changed our understanding of the Sun's outer buildup", says Peter. "Instead of a stable temperature distribution, there are apparently dynamical processes within the cool photosphere that can turn everything topsy turvy." Already in 1917, the American physicist Ferdinand Ellermann discovered areas with higher temperatures within the photosphere. However, they differed from their surroundings only by a few thousand degrees and can therefore be considered rather minor temperature deviations. Whether the newly discovered explosions are linked to this phenomenon, is still unclear. One of the other publications in Science magazine, to which scientists from the MPS have contributed, also paints a new picture of the processes on the Sun. Researchers under the lead of the Harvard-Smithsonian Center for Astrophysics found that the solar wind, the continuous stream of particles from the Sun, does not leave the Sun's surface uniformly, but locally in highly energetic jets. These observations, too, are based on data from IRIS.